A documentary chronicling the rise of mixed martial arts superstar "Notorious" Conor McGregor. Even if you don't follow the sport of mixed martial arts (MMA), chances are, you've heard the name 'Conor McGregor.' He is one of the biggest names in MMA. Hell, he's probably one of the all-time biggest names in combat sports period, but that wasn't always the case. 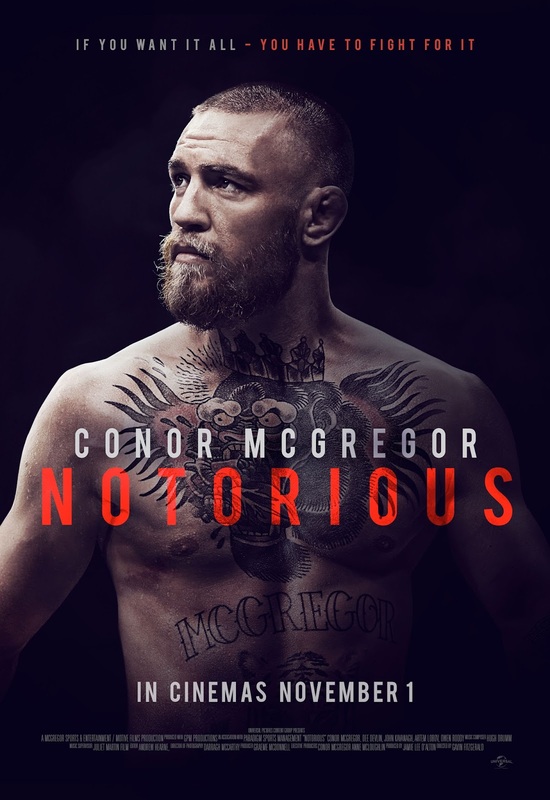 Director Gavin Fitzgerald began filming his documentary, "Conor McGregor: Notorious," back in 2012 before Conor was signed by the UFC, the premier, cream of the crop organization in the sport of MMA. When filming began, Conor was fighting for a regional European promotion called Cage Warriors. Back then, he and his girlfriend Dee Devlin were steeped in bills and living with Conor's mother with only a dream of stardom. After winning the Cage Warriors lightweight championship, Conor finally got the call to fight in the UFC. He made his debut in the UFC on the preliminary card of the "UFC on FUEL TV 9: Mousasi vs. Latifi" event in 2013, making the league minimum of about $8,000 to show and $8,000 to win. He knocked out his opponent Marcus Brimage in just over one minute. From there, "Mystic Mac" began his meteoric rise to the top and quickly became the biggest money earner in UFC and in all of MMA history. It must have been a serendipitous stroke of luck that Gavin Fitzgerald started making "Notorious" back before Conor McGregor was the Conor McGregor. This is a rather uplifting rags-to-riches story, and by far the most compelling part of the film is the deep dive into McGregor's early years when he was a struggling fighter with only an aspiration to be the best. The hope, the determination, and the drive Conor had to make it in MMA is inspiring. Everything McGregor said he was going to do he eventually accomplished, and he did it with his loving, loyal girlfriend Dee by his side, pushing him and supporting him every step of the way. Fitzgerald traveled all over the world to chronicle Conor's rise to the top from countless training sessions to endless weight cutting, from his humbling defeats to his record-breaking wins. To see McGregor go from being on the dole and living with his mom to being able to provide for himself, his friends, and his family is absolutely insane and awe-inspiring. His life now is a lavish one as he owns multiple homes in the United States and Ireland, has a car for every day of the week, and now even has his own production company. One would think that a young man in his mid-20's would blow through that money as fast as he got it, but McGregor just keeps making more and more dough, and if you know anything about Conor, you know he has expensive taste. The big drawback to "Notorious" is once Conor enters the UFC, the rest of the story is mostly common knowledge if you're an MMA fan (the target demographic). The only thing we weren't aware of is that Conor fought with a partial ACL tear when he faced Chad "Money" Mendes in July 2015, something only his training partners and family were aware of at the time. That being said, this documentary is still quite entertaining, mainly because Conor McGregor himself is so damn charismatic. He is a flashy, magnetic personality, and we had a good time watching this because of that showiness.